The most common type of air conditioning system is the split system, which puts the air handler inside the home and the condenser and compressor outside the home. The technology used for these systems has not changed dramatically for decades, and different manufacturers make largely identical products. So when you're shopping for an air conditioner, consider efficiency as indicated by the SEER, manufacturer reputation and reliability, the size of the unit, any government rebates, and contractor expertise. 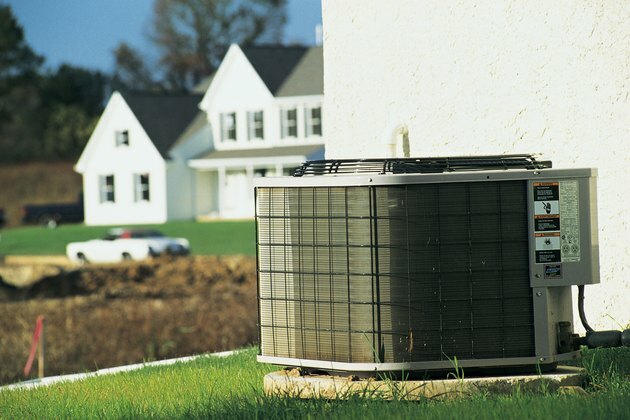 People purchasing a new air conditioner often think that the most efficient unit is clearly the best. However, this is not always the case. Extremely high efficiency air conditioners can cost over $1,000 more than a standard unit, but save minimal amounts of fuel and money. You may never break even on the extra cost. The SEER is an efficiency rating that compares the amount of energy required to produce a cooling effect. You can calculate it by dividing BTUs by the wattage consumed. The higher the number, the more efficient the air conditioner. The minimum SEER rating allowed in the U.S. is a 13. The best place to buy a split system air conditioner is from a trusted HVAC (Heating, ventilating and air conditioning) contractor. Many work with a specific brand of equipment, but some install several different brands. Be sure the contractor is certified to install the brand you choose. For example, cheaper Goodman units (including Goodman, Janitrol, Amana) have high repair rates, but don't require certification from installers. Often problems are related to faulty installation rather than product. Trane and Bryant are well known names, but GE and Westinghouse make comparable products, and may price aggressively or offer great warranties to compete. For a standard split system air conditioner (between 13 and 15 SEER rating), you can expect to pay about $3,000 for the equipment. Special installation or ductwork may add another $3,000. Larger capacity systems are costlier. Installed split system heat pumps (both air conditioning and heating) cost about $5,500 for standard SEER. High efficiency air conditioners, between 16 and 18 SEER, usually run about $500 more, and ultra high efficiency (19 to 23 SEER) will add an additional $500 or so to the final cost. Many experts agree that the extra cost for ultra high efficiency does not pay off. Be sure your contractor uses "Manual J" calculations in figuring the size of air conditioning unit needed for your home. If you like to have the "best of the best," then you may want an ultra high efficiency air conditioner. Otherwise standard or high efficiency is adequate. The accessory most often purchased for a split system is an extended warranty, either on the equipment or on the service. Depending on how long you plan to live in the home, a service contract can be a good idea, but don't buy into it without comparing costs. It may save you money on discounted repairs. Look for air conditioner warranties that cover the labor involved in repairs. There aren't many, but you can find them. This could represent a significant savings. The standard warranty is ten years on the compressor, five years on all other parts, and no labor costs covered. Some installers will give you a year's labor guarantee; shop around before you buy. Don't fall for the "bigger is better" claim when it comes to air conditioners. The right size is most cost-effective and comfortable for your home. Unscrupulous contractors will sell oversized units, costing the homeowner both initially and throughout the life of the system. They are inefficient and cycle off and on frequently. A properly sized system will be on most of the time in very hot weather. Avoid calling the biggest contractor in town -- you'll pay for the name recognition. Ask friends for references, and you'll often find smaller contractors who are reliable and fair.